The Pan Philian Club Records collection consists of records generated by the club from its inception in 1920 through the 1960s. Records include meeting minutes, correspondence, news clippings, programs, and projects. Materials are arranged alphabetically by document type. Materials were presented in two chronological scrapbooks; however, due to their condition, materials were removed and rehoused. 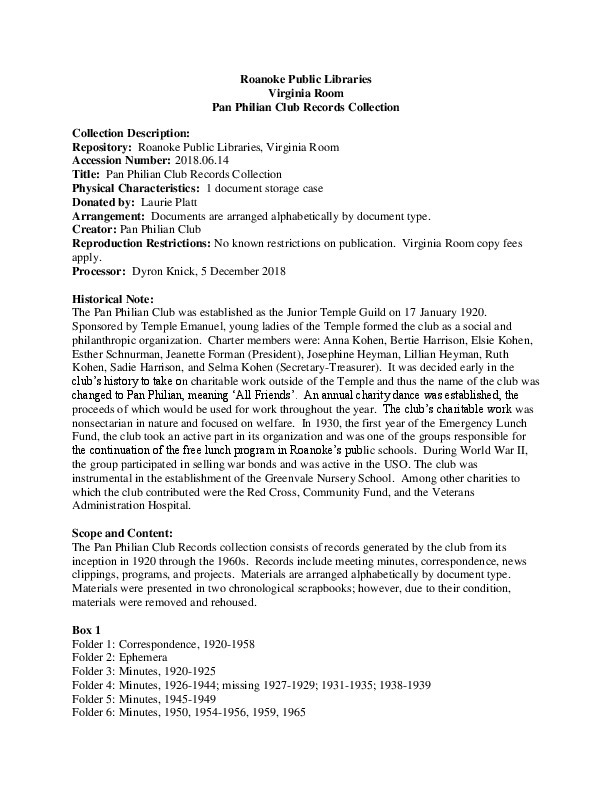 Roanoke Public Libraries, “A Guide to the Pan Philian Club Records Collection,” Virginia Room Digital Collection, accessed April 21, 2019, http://www.virginiaroom.org/digital/document/PanPhilianClub.